Heat oven to 350 F. Unwrap all of your Peppermint Bark Bells and put them in the freezer about 30 minutes before baking your cookies. In a medium mixing bowl, stir together flour, cocoa, baking soda and salt. Beat butter, brown sugar, granulated sugar and vanilla extract in a large mixing bowl. 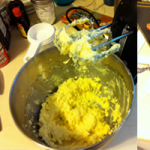 Add eggs to butter mixture, and beat well. Gradually add the flour mixture, blending well. Stir in the chopped Mini Kisses. Shape dough into 1 inch balls, roll in granulated sugar and place on a greased cookie sheet. Bake 7 to 9 minutes or until lightly browned. 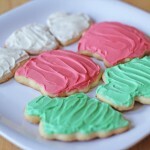 Remove from oven and place the cookies on a wire cooling rack. 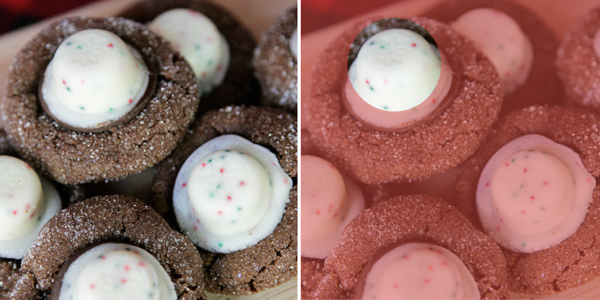 Then, press a cooled Peppermint Bark Bell into the center of each cookie. 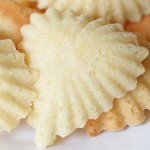 The cookie will crack around the edges. Let cool completely until the candies, which will have melted a bit at the bottom, have re-hardened. Makes about 3.5 dozen cookies. The big difference between using the full size Hershey’s Kisses in the peanut butter blossoms and using the Bells with these is that the Bells have a lower melting point than the Kisses. That’s why they should be put in the freezer for a while before they’re pushed into the warm cookies. I really recommend moving the cookies from the cookie sheet to the cooling rack and only then pressing the Bells into the cookies. Then just leave ’em be until they candies have again solidified. 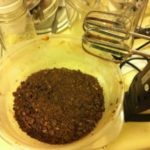 This technique is what produced the most pleasing aesthetic result for me, but of course, cookie are about way more than being pretty! 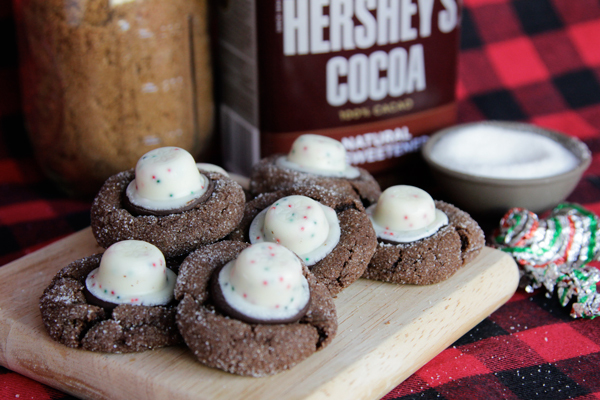 The recipe for the chocolate cookie base of these blossoms, ironically enough, is an adaptation of a “Holiday Double Chocolate Cookies” recipe cut from the package of Hershey’s candies in the 80s or 90s. I found it taped to the pages of my mom’s recipe book on a recent visit home. What a coincidence, right? 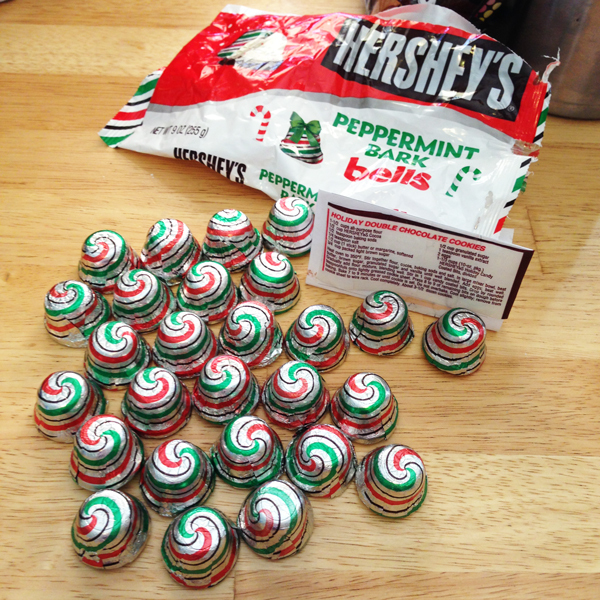 Once of my favorite things about these candies that this recipe does a great job of showing off, is the poinsettia shape stamped into the top of each candy. While you’ll need to unwrap one bell per candy (just like for peanut butter blossoms), you get the payoff of having a cute holiday shape on top of each cookie. The candy used in this post was provided by Hershey’s. Be my neighbor, these look awesome!